Channel Nine should be hoping for a bumper TV audience this weekend after the two participating teams – the Melbourne Storm and the North Queensland Cowboys – polled at two and three respectively in a leaderboard for the most supported clubs. The fan survey, by Roy Morgan Research, once again had the Brisbane Broncos as the most supported team with 1,020,000 fans. The Parramatta Eels, who ranked fourth with 457,000, were the most supported of the Sydney clubs. 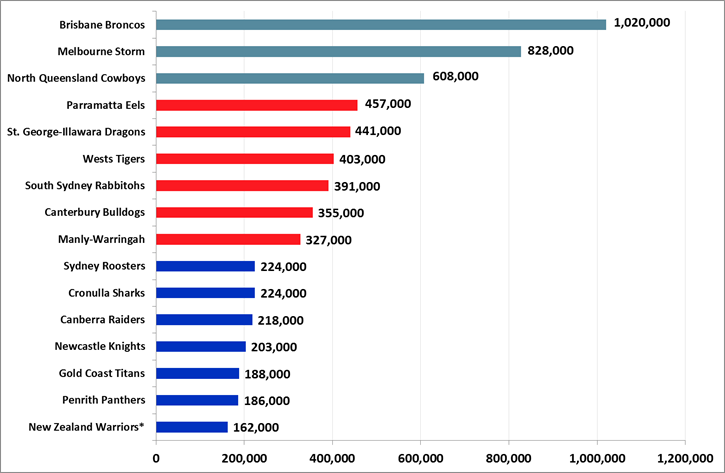 As reported on B&T last week, the Sydney Swans were the most supported AFL team with 1,204,000. The Broncos win in the survey will do little to quell the voices in the NRL who want a second team in Brisbane. There had been talk a Sydney team could be forced to relocate, however, the game’s bosses are well aware of the damage that would be done with such a move. The least supported NRL team was the New Zealand Warriors with just 162,000 fans. A fairly dismal effort considering it’s the one team in a country of 4.7 million. The Gold Coast Suns are the AFL’s least popular team with just 106,000 supporters, while the Gold Coast Titans had 188,000. Commenting on the study Roy Morgan’s executive chairman, Gary Morgan, said: “The Brisbane Broncos with 1.02 million supporters are again Australia’s most widely supported NRL club – a position the Broncos have held unchallenged since the NRL commenced operations in 1998 following the Super League split. “The Broncos have over twice as many supporters as any Sydney-based NRL club including long-suffering Parramatta Eels supporters on top in the Sydney market with 457,000 supporters ahead of two merged clubs – the St. George Illawarra Dragons on 441,000 supporters and the Wests Tigers with 403,000 supporters. “The strong support for the Broncos is evident when one considers the home attendances for NRL clubs. The Broncos are the only NRL club to average home attendances of over 30,000 spectators.